Claude Lalanne. Photo: Paul Kasmin Gallery. 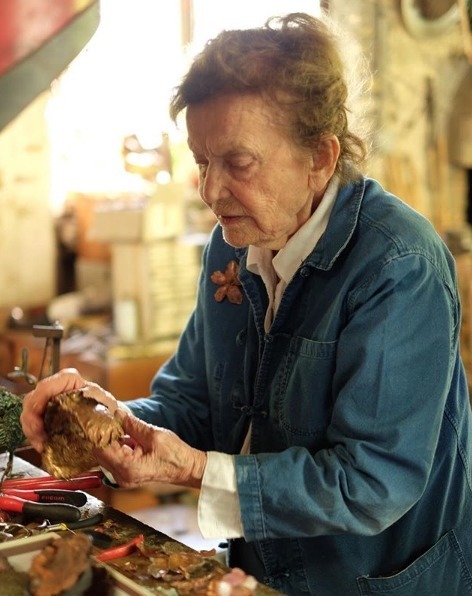 The French artist Claude Lalanne, known for her whimsical nature-inspired sculptures, died in Fontainebleau on April 9 at the age of ninety-three. Lalanne worked as a duo with her husband, François-Xavier, from the 1960s until his death in 2008. Together, Les Lalanne, as they were known, created playful and surreal objets, often from cast bronze and in the form of flora and fauna, including sheep, apples, and rabbits. (She earned cult status when one of her worksa man with a cabbage for a headappeared on the cover of Serge Gainsbourg’s 1976 album L’Homme à Tête de Chou.) Lalanne frequently collaborated with designer Yves Saint Laurent, for whom she created jewelry and a sculpture of model Veruschka’s bust for his fall 1969 collection. She continued to work with the fashion industry well into this current decade, designing accessories for Dior’s spring 2017 collection. “I am incredibly sad to lose a great friend and artist. I was always fascinated by my many, many visits to her and her family’s magical world,” Paul Kasmin said. The dealer presented an exhibition of Les Lalanne’s work earlier this year. They were recently the subject of a retrospective at Les Arts Decoratifs in Paris, and their work is in the collections of the Cooper-Hewitt, Smithsonian Design Museum in New York and the Centre Pompidou in Paris.